I'm ruminating some design ideas that I'm not prepared to detail just yet, but I had "an experience" deconstructing a lace pattern, and I thought it might be worthwhile to share what happened during the design process. So... 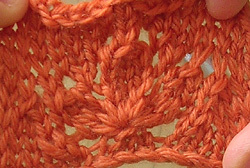 I originally was thinking about how one might knit a coral polyp in lace. They're quite pretty, actually. I thought that the ends looked something like stars. Now I remembered Marnie knitting something she had described as "star stitch" and browsed her archives until I found it. Hmm... It was definitely pretty and star shaped, but it was a little small, not quite what I had in mind. What a fantastically clever idea! The nupp is used as the starting point of a 3-petaled flower, and the decreases are gradually made over the next few rows. The flowers are tiled such that the increases in 1 repeat occurs with the decreases in the next repeat so the fabric doesn't buckle. I'd not seen anything like it before and was immediately intrigued. I thought I could use a single "tile" (or motif) of this stitch pattern as my polyp, and I read anxiously through to see if directions for the stitch pattern were somewhere in the article. No such luck, although the author references a Estonian-language lace dictionary in that article. Sucker that I am, I found someone who carried it and ordered the book that day. But I didn't want to wait for a package to arrive from Germany (what can I say - I'm an American - I like my instant gratification), and I've deconstructed lace before. How hard could this be? Well, as it turns out, it was kind of hard. Now, for the love of God, do not tell me that this pattern is widely known and available on some site that I've never encountered. You'll make me weep. I studied the picture and wrote down everything that I was sure was happening. 1. The base of the flower was 3 stitches. 2. Each petal was 3 stitches wide. Thus, the base had expanded from 3 to 9 stitches. 3. The center petal was surrounded by yarnovers. 4. Each petal ended with a 3-into-1 decrease (eg, sl2, k1, pass sl sts over). 5. The 3 st that formed the base of the flower were derived from the last stitch of the right-most petal of the tile to the left, the center petal from the tile below, and the left-most petal of the tile to the right. I wasn't sure of the maximum width of the tile, the exact location of yarnovers, or the number of rows per tile, but constraits of The Maths said that the number of yarnovers would dicate the final width, and I would likely be knitting 1 row for every 2n decreases (I saw nothing that seemed like an unpaired decrease). As long as I had the same number of increases and decreases, the pattern would work. 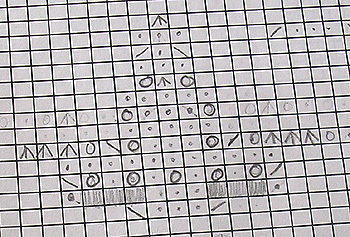 I also had no frickin' idea how to chart a bobble. I emailed Kim and begged for help. She replied, "I don't know of any books in modern standard notation that show nepps clearly. Most avoid the whole bobble idea by just putting a 'there be bobble here' symbol in the main chart and offering up the bobble instruction elsewhere. " 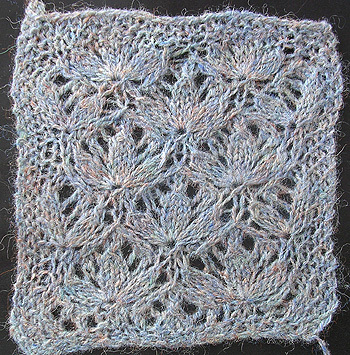 She suggested using grey boxes to indicate "no stitch" (tutorial here) and sent an example. Thanks, Kim! I swatched and was able to make the main flower easily. I ignored the side stitches, figuring that they would be other tiles in the final iteration. 1) The motif was too tall. I had ended the side petals long before I was ready to start the staggered motif on either the side, so I had too many rows. Because most of my lace experience is with patterns that are straight knit or purl across the back, I hadn't considered doing some of the decreases on the private side. If I decreased on the front and back sides, I could squash the motif into fewer rows. 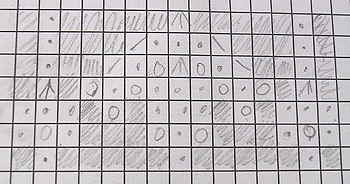 2) No knitter would have any idea which stitch aligns with which from the row below. Clearly, lots of grey ("no stitch") boxes are needed. I struggled with where to put the grey boxes. 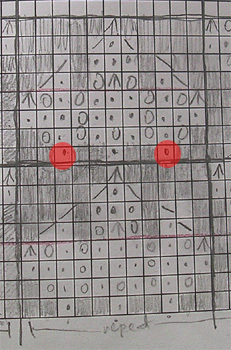 In the example below, the red dots should have lined up with the tent-shape boxes (3-into-1 decrease) to the left and right boxes of the previous row. 3) The pattern would not tile. Remember, the center stitch of each side petal contributed to the flower base of the motif next to it. However, if I matched up the tile on 1 side (blue), it would not match on the other (red). The pattern repeat as I drew it above has 7 rows. BZZZT! It works a little better if I use an even number. I forget what was wrong with this, but it had a problem. However, I was close - could nearly taste victory. I had a few other problems that are hard to explain, so I'm just going to gloss over them for now, but I had the final chart at 10 PM one night. The next morning, I swatched on the way to work. Now I'm really looking forward to the arrival of my Estonian lace book! I feel like I'm waiting for the answer key to a pop quiz. JUNE! What a fabulous post. I am so glad you posted this here because it's the first one I've come across that discusses the entire process of deconstructing lace. That design is beautiful and is the first time I'd seen a motif that expanded on the nupp that way. I loved reading your post too! It was very helpful. Great post! I'm currently trying to modify a lace pattern myself, and though the challenges I'm facing are a little different, it's fascinating to read about your process (both here and in the older lace-deconstruction post on your blog). Thank you!! GORGEOUS-is the word that comes to mind. I've tried my hand at deconstructing lace before, but I generally give up unless it's a pretty simple and obvious pattern. Hats off to you and your stick-with-it-ness. I think I'm in love with you. That is so freaking cool. The lace pattern is gorgeous and I love seeing your process of finding it. I have been through many lace books and have not seen this motif, so I also think it was time well spent. I will definitely try it out sometime. This is exactly the kind of posting that I dreamed of getting with this blog, so keep them coming - brava! I can't believe that I've missed out on your blog all this time - I will definitely check it out. I have been a fan of your DNA scarf since I saw it in IK, and its filed away in my mental rolodex, waiting for the right recipient. I have been thinking about deconstructing this pattern myself lately. I think your swatch is realy lovely but not the same as the original, there are one or more rows missing between the flowers. Thanks to all who have commented! I appreciate your thoughts. Mitz, when I get the original pattern knit up, I will post a comparison of the two. I'm ok with being slightly off from the original - at least that way, I can claim the chart as my own! Mitz has a really sharp eye. I'm not sure that I would have picked up on those subtle differences. Having said that, I think I may prefer your version, June. It has a slightly more modern look to it. I'd love to see a comparison as there is no way I could work out the differences without some serious time and paper! I think both versions are really beautiful--great post. how do you do the cdd on the purl side? 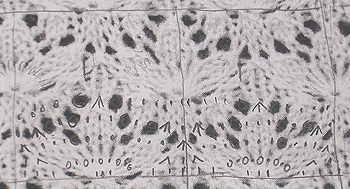 oh , and also did you end up posting a comparison between this and the traditional pattern?